"Nutty cinnamon quinoa with dates, apricots, toasted almonds, and honey." Toast the almonds in a skillet over medium heat until just golden, 3 to 5 minutes; set aside. Heat the cinnamon and quinoa together in a saucepan over medium heat until warmed through. Add the milk and sea salt to the saucepan and stir; bring the mixture to a boil, reduce heat to low, place a cover on the saucepan, and allow to cook at a simmer for 15 minutes. 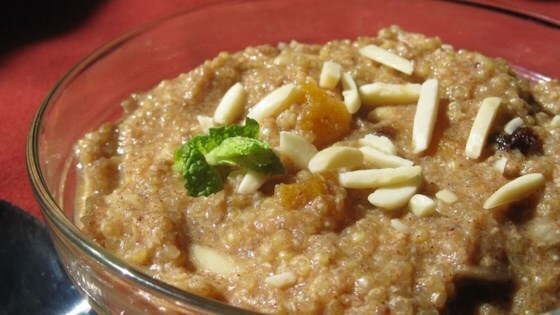 Stir the vanilla, honey, dates, apricots, and about half the almonds into the quinoa mixture. Top with the remaining almonds to serve. This is a great recipe. I made a few changes and loved it even more. Instead of vanilla I added Brown Sugar and some mixed nuts. Very good! I used half apple juice/half milk...worked out great! Next time I may put chopped apples in, a great autumn change. I tried this yesterday and fell in love with it. It is easy, healthy and different.